One of the first utilities I install on a new OS is CCleaner (Crap Cleaner). This software will clean any temp files, log files, or history left behind by a myriad of applications (more added with each version) freeing a lot of space in the process. 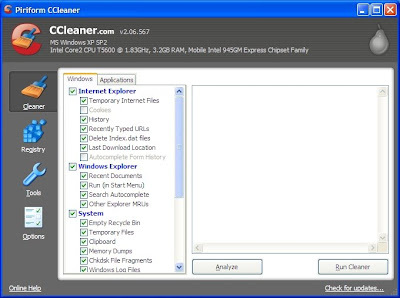 CCleaner can be launched by right-clicking the trash can icon (if you so choose). It can either analyze all your drives and system folders - telling you how much stuff will be removed, and giving you a full file list. Or, you can trust the software to go on its own and clean. An exceptions list allows you to save files you may want to keep (such as cookie files, saving you from logging in to certain sites, or certain log files). It takes care of both IE and FF nicely and you will be surprised with the amount of space you save after every run. I also love the clear UI that is typical to all of Piriform's applications. My recommendation: if the amount of files removed exceeds 500Mb, defrag the drive after the cleanup process, to improve operations.